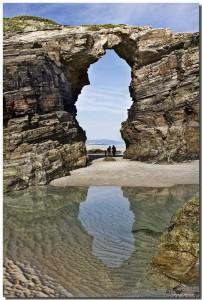 Playa de Augas Sanatas (Beach of the Holy Waters) was renamed in Playa de las Catedrales (Cathedrals Beach) for its spectacular arch-shaped rock formation around it, that resembles the arches of a cathedral. It is located in the province of Lugo (Galicia), just 10 kilometers west from the town of Ribadeo and although it is not situated on the Spanish Mediterranean coastline but on the Cantabric Sea coast, we absolutely need to nominate it as it is one of the most beautiful Spanish beaches. According to Tripadvisor.com, it is the fourth best beach in Europe. These spectacular cliffs that were sculpted by the sea and the wind making a landscape that will leave everyone breathless. All its arches, caves, labyrinths and sand corridors through the cliffs can be seen and explored during low tide, so if planning on visit be sure to visit this spectacular beach during low tide. You can check out the tide times on www.meteogalicia.es. But if visiting during the high tide you can always enjoy the spectacular panorama from the cliffs or refresh yourself in the restaurant nearby waiting for the low tide. Although its waters are cooler than most of you would expect, giving a swim is absolutely worth it. There are two major parking lots nearby and camping places for those who like to enjoy the nature to the fullest.